We've been having success with our optimal lineups in cash games and 50/50 plays. We expect the trend to continue in week 6 with some exceptional value plays and under priced players, especially in Yahoo Daily Fantasy. 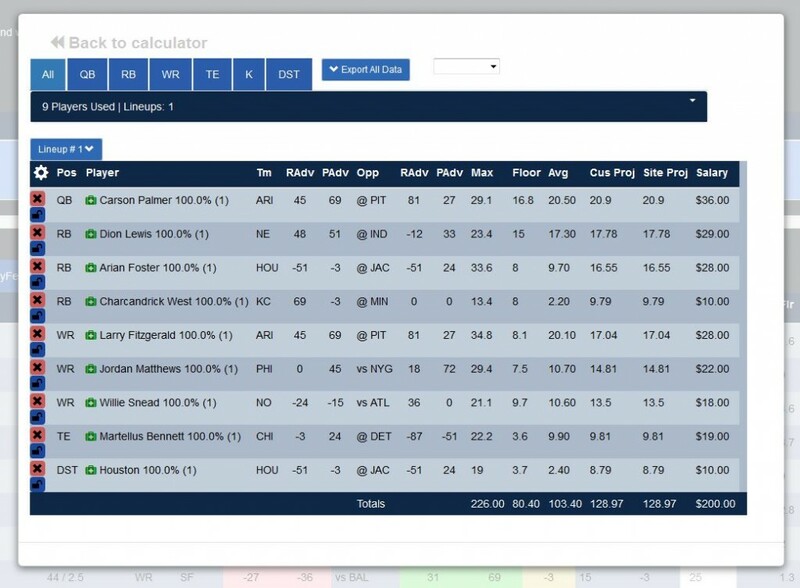 One of our members mentioned here that he's simply been using the default setting in our optimal lineup tool to get his cash game lineups, man that's trust! But goes to show that not much tweaking is required as the projections only get better with each passing week. In the below lineup I did remove some of the players that the default optimizer recommended because the rushing and passing advantage metrics just didn't suit my taste. Nevertheless, almost all of these players came highly recommended by our optimal lineup calculator. 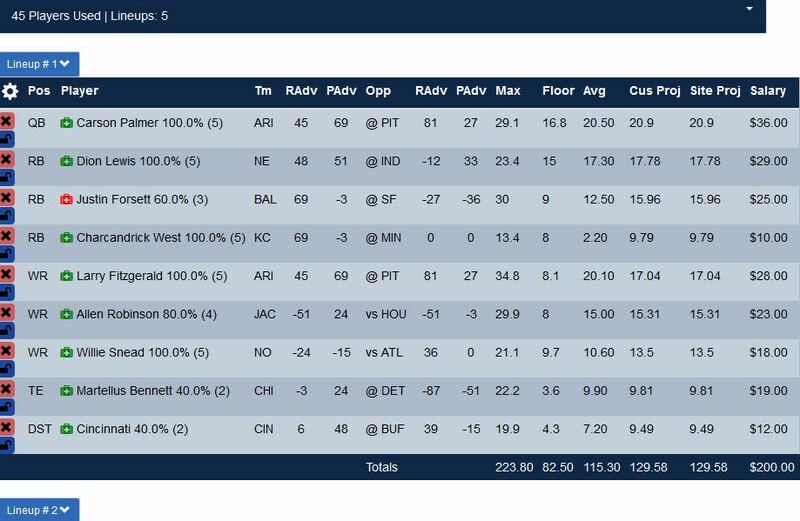 Here's the optimal lineup for cash games on Yahoo. Week 6 Yahoo Lineup for Cash Games and 50/50 plays. Charcandrick West - With Charles out his price is great this week. Little risky but worth the savings. Houston - For the price the value is there and Jacksonville has given up the most points to opposing defenses this season. Antonio Gates - Last week was his welcome back party and I think it continues this week if S. Johnson is out. Justin Forsett - His touchdowns are coming, the yardage is already there. Dion Lewis - This could be the week he jumps into the top tier, some already think he's there. Willie Snead - Colston is out so this only helps his targets, Coleman is a sleeper for GPP tournaments. Jordan Matthews - The Eagles seemed to hit their stride last week and should continue to build off of that going forward. New England - Remember the team that called them out for Deflate Gate, ya, that's right! Allen Robinson - If you choose Robinson you may want to avoid the Houston defense. Not a good choice to have your offensive players going against your defense. Martellus Bennett - Even if Jeffery suits up he'll be less than 100 percent. Cincinnati - Buffalo's slight RAdv should keep the game pace slow and low scoring, which is what we want, well that and sacks / turnovers. As Mr. Jones pointed out in the comment section, Justin Forsett has yet to practice this week (ankle). Coach John Harbaugh expressed optimism on Forsett's Week 6 availability but I'd like to give you another optimal lineup just in case. Here we go! behold, the Palmer Lineup! Once again this is a cash game - 50/50 lineup. Not to be used for GPP tournaments.